The biggest night in Hollywood is coming up on Sunday and after reviewing the collections from Fashion Week, it's easy to see that many designers had this in mind when curating this season's looks. Here are some styles that I think would be perfect for the Academy Awards. Although I'd love to see Jennifer Lawrence branch out a bit, it's a pretty safe bet that she will be wearing Dior to the Oscars. Contrasting her cream princess-style ballgown from last year, this dress would be a more modern and unique style for her. By adding some sparkling jewels, this could make a real statement. Nearly all of the dresses in Elie Saab's Spring/Summer couture collection were red-carpet ready. 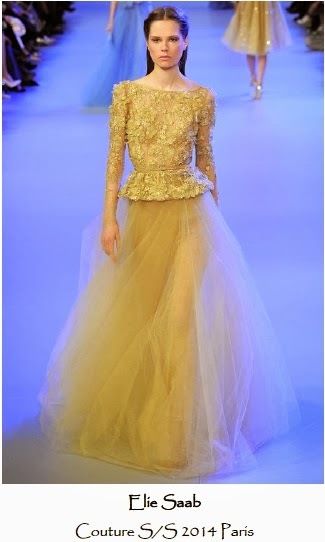 This pale gold gown mixes structured peplum and floating tulle for a romantic look. While nominees Julia Roberts and Meryl Streep usually go for more pragmatic styles, I would love to see one of them in something like this. This Jenny Packham dress would look gorgeous on Sandra Bullock, who loves to play with asymmetrical lines and varying textures. It is a classy take on the sheer trend, with immaculate draping from the shoulder. Now this is an Oscar-worthy look! 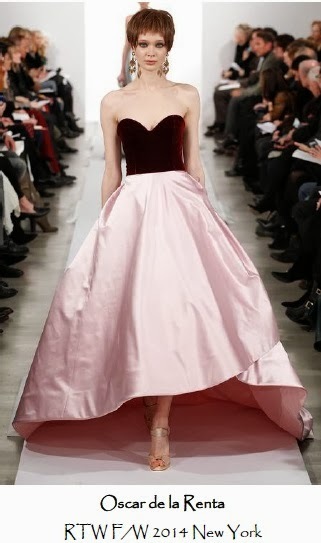 The mixing of scarlet colored velvet and pink silk along with the perfect shoe-framing length, make this dress a fabulous choice for someone like Amy Adams, who is a front-runner in the Best Actress category. As soon as I saw this unique three-quarter sleeve dress by Tony Ward I thought of the newest red-carpet darling, Lupita N'yongo. Her Oscar gown choice is highly anticipated and interviews reveal that she does her fashion research. Tony Ward would be an unexpected and chic direction for her biggest award show turn to date. Regardless of who wears it, I am dying to see this dress hit the red carpet! It would be such a major fashion moment, as long as the hair and jewelry are kept simple. The elements of sheer and lace detailing create a fresh yet elegant look. I think someone like Cate Blanchett, who loves high fashion and unique details, would look great in this.